Posted in Government, News, Research, under Africa Asia Europe North America South America. Tagged with British Council, DAAD, IEAA, IIE, TNE, Transnational Education. The first comprehensive global data showing the impact of transnational education (TNE) on host countries has been released. Findings from the study show that TNE is often an affordable alternative to traditional student mobility and is seen to better prepare students for the job market than local providers. The research, conducted by the British Council and the German Academic Exchange Service (DAAD), surveyed 2,000 TNE graduates, non-TNE graduates, faculty, government agencies and employers. It is the first in-depth look at the impact of TNE in 10 countries in Asia, Africa, the Middle East and Latin America. Transnational Education is a term given to many forms of higher education where the delivery is done in a country different from the awarding or overseeing institution is located. International branch campuses, bi-national universities, double degree or joint degree programmes and distance or online courses are all classified as TNE. The top advantages and challenges to TNE reported by respondents concern the cost. Overall the number one positive benefit of TNE for institutional and government leaders as well as students is that is provides an affordable alternative to studying abroad. Students also said that TNE strengthened their international outlook and promoted intercultural understanding. “This is solid evidence that the increasing interest and demand for international education can be partially met through programme and provider mobility- not only through student mobility,” the report states. 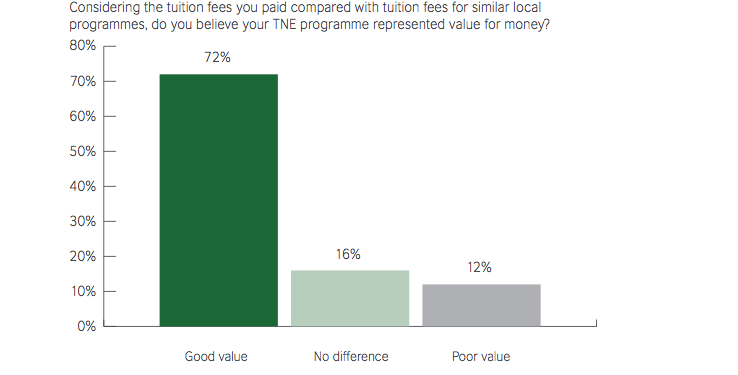 However, despite the positive view that TNE is more cost effective than going abroad, respondents also said the top negative attribute of TNE is the high cost for students compared with local programmes. “This dilemma will likely not be resolved as there is no doubt that the involvement of a foreign partner in designing, delivering and monitoring TNE programmes does involve extra expenses,” the report argues. Improving professional skills for career development was the number one rationale motivating students to enrol in TNE- 61% of respondents believed that studying a TNE programme would increase their earning potential relative to studying a local programme. Students were firmly of the opinion that TNE qualifications gave them an edge in the jobs market, mainly because of the prestige of the foreign university and the fact that they had developed an international outlook. “Branding and profile of the foreign partner or parent institution has an influence on a student’s decision to enrol in a TNE programme, as the perceived importance of the qualification and the status of the awarding institution ranked in second and fourth place respectively as key motivations for TNE students,” the report adds. In general, stakeholders are optimistic that the number of TNE programmes and the capacity of existing ones will expand over the medium-term. The study was carried out in participation with Campus France the International Education Association of Australia and the Institute for International Education and follows a pilot study released last year by the British Council. The second phase was conducted with the aim to offer more robust data on four impact categories of TNE: academic, cultural/social, economic and skills. Surveys were carried out in host countries with “mature TNE markets” and include Botswana, Egypt, Hong Kong, Jordan, Malaysia, Mauritius, Mexico, Turkey, UAE and Vietnam. Countries providing TNE are led by the UK, Australia and Germany. The majority of the 912 TNE student respondents (54%) were at international branch campuses- half of which were UK-based awarding bodies. Business & finance was the most common subject of study.